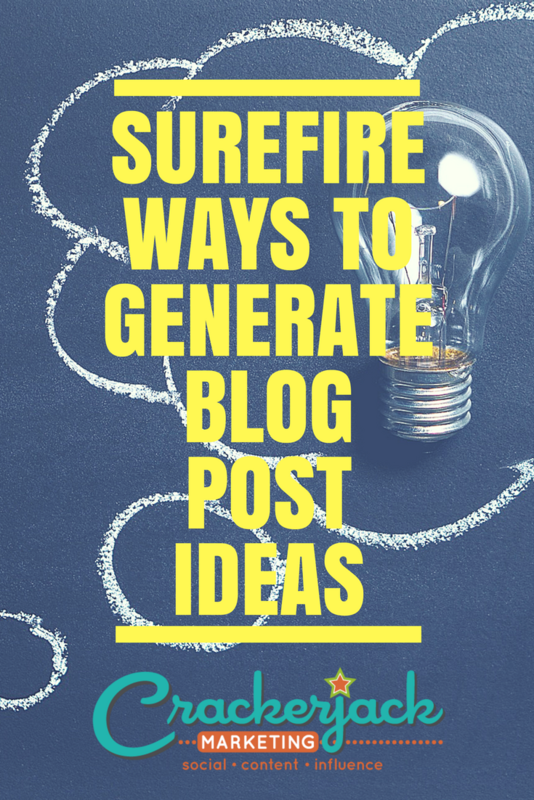 “Surefire Ways to Generate Blog Post Ideas” was co-authored by Stephanie Schwab and Christina Strickland. Sometimes the hardest thing about having a blog is figuring out what to post on it each week. Maybe you started with a bank of grand ideas, but as you used them up, your blog started to feel, well, a lot less fresh. Perhaps you’ve struggled for ideas since the very beginning. The good news is you can stop liberally applying your forehead to your desk. No matter what your business, it’s likely that you get a ton of questions each week. And the questions you get represent more than the inquiries of a mere few. They are questions hundreds or thousands of other people have about your products and services. These questions provide an easy way to learn what your customers want to know, so you can provide them with information they need. And since you get all of these questions anyway, why not translate them into blog posts? Answer each question with a brief (or longer) post. You can even put the posts into a Q&A format (put the question at the top, then answer it below). Get your whole organization involved. Ask everyone in your organization to keep a record of the questions they get. Pay attention to the questions that come up repeatedly, but don’t ignore those that come up only once. If many people are asking the same question, you can be certain there’s an audience for the answer. So, then, why not just scrap those rare questions? Well, for every person who asks a question, there are many more out there who wonder the same thing. When it comes to creating good blog content, you really don’t have to reinvent the wheel, and neither do you need ESP. Stop guessing about what your readers want to read, and just ask them. This is another reason social media is so great. You can use that social contact to ask your followers what they are interested in reading. Ask your readers what they’re interested in via the comments. This is the easiest way to get answers. Create polls. Many people enjoy participating in them, and they are a good way to gauge interest. Learn from the answers you receive. You will absolutely get blog ideas from asking these sorts of questions, but you may also get something else priceless–feedback! The answers you receive provide insight into what you’ve been doing right and where you’ve been falling short. Haven’t asked for feedback yet? You may already have a source of ideas at your fingertips. Your readers’ comments can give you great insight into what interests them and what they want to read. Notice which blogs and posts generate the most comments, and then read each comment. Often, readers will present a point of view that leads you to your next post. Don’t rely on your readers to know you want comments. Encourage comments and sharing on every post. If you have some posts that do not get any comments, this doesn’t necessarily mean the topic was way off base. Still, it is revealing if most of your posts do get comments and you have a few with absolutely nothing. Where do your readers go for relevant news about your industry? Why not become a reliable source of the news they seek? 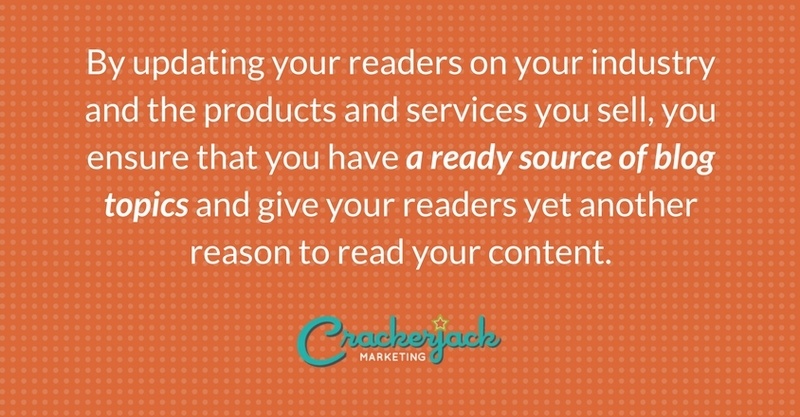 By updating your readers on your industry and the products and services you sell, you ensure that you have a ready source of blog topics and give your readers yet another reason to read your content. Keep your readers interested by writing blog posts about changes and improvements not only in your industry but also within your company. Create behind-the-scenes posts as well. Most people love to read about the goings on at the companies they patronize, and many like to read about the people making it all happen. Some of the best blog posts are those that teach the reader how to do something. These are really useful posts that people tend to save and refer to again and again, sharing them with others as well. Write how-to posts, or create photo and video tutorials, that teach your audience how to use your products or services. Produce life hack posts that demonstrate how your products or services can make your readers’ lives easier, better, and/or more fun. Produce posts that share how real customers have used/benefited from your products and services (skip the blatant promotion, however). Think more human interest story than an advertisement. Chances are you have employees that are pretty much experts on some topics. Are those topics relevant to your audience? If yes, get them to writing. Having your employees (or you) cover these topics demonstrates that you are a leader in your industry. Ensure that these posts tackle specific issues and are truly useful. This is not a big chance for the expert to blab about how much he or she knows. Avoid talking down to your audience or bad mouthing others in the industry. This will only turn your readers off. You have a bunch of engagement-monitoring tools at your disposal, right? Well, they’re not just there to look pretty. 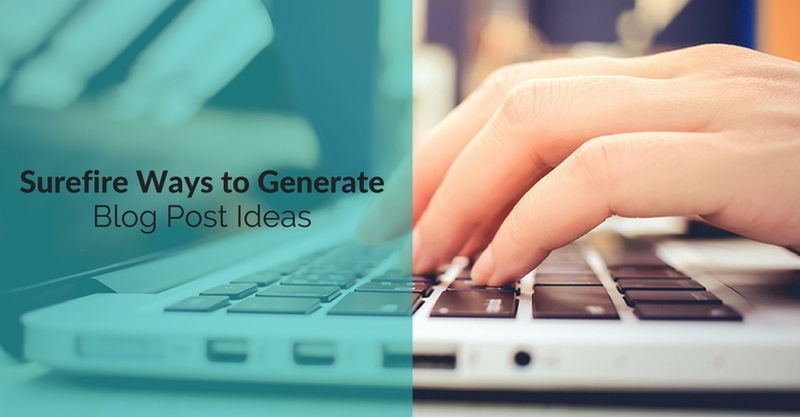 Use them to drum up blog ideas! All of those shares, likes, retweets, and favorites do more than just say you did a good job. They give you important insight into the type of content that really excites your audience. Use all of this engagement information to figure out which types of content to produce more of and which types you might want to pass up next time. Be sure to analyze your click-throughs as well. Evaluate click-throughs that lead not only to your site but also to content on third-party sites. With the above advice to hand, coming up with good ideas for your blog needn’t be an exercise in frustration. Just remember to mix up the types of blog posts you publish as too much of even a good thing can get, well, boring. How do you get new post ideas? Share your tips and tricks!